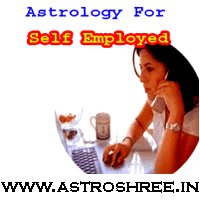 Astrology for self employed persons, what to do as per astrology to get good return on investment. Self employed persons are very great because they have trust on their qualities, they are committed to use their full time to en-cash their knowledge. To be a self employed is not as easy as it seems because in today's time competition is too much so a self employed has to work much to prove the quality. This article i am writing for the lions who want to prove their qualities in this world. If you have some qualities and want to establish your own firm then this article is for you,If you are an entrepreneur then this article is for you, if you are already self employed then this article is for you. If you are not getting success in your field then this article will clear you the ways to over come from the problems. read about Career as per 10th House lord or Dushmesh. Self employed persons have a opportunity to get the name, fame, money, power if move smoothly in path. But it is not so with every self employed. Now the question is that how to know with our horoscope that we are able to run our own business, consultancy etc. How to know that which field is good for us?, how to know that which is the main power planets in our horoscope, how to increase the power of our planets to get success in this world. If the Working place is govern by very positive sun then no doubt the person is able to establish his or her own firm, business, consultancy. If the Master of Income place, profit place and working place are positive and with this of the lagna is also supporting then also it increase the power to become a self employed. If the Mercury is supporting the person and it is the master of Working place or income place or profit place then also the chances increases to be a successful self employed. If the destiny place is governed by strong and positive planets then also it increases the chances to be a successful self employed person. If the center houses of horoscope or kundli or birth chart are governed by strong and positive planets then also it supports the person to be a successful self employed. Who comes in the category of self employed? Professionals like doctors, engineers, garage owner, hotel owner, service providers, gym owner, builders, astrologers, vastu consultants, shop owners, website designers, bloggers etc are self employed persons. Read about Career as per planetary combinations in Horoscope. What To Do To Get Success In Desired Field? After analyzing the horoscope it is possible to know the reasons of failure, the reasons of unsuccessful, the reasons of slow growth etc. Suppose if there is any planet which is creating problem in life and generating obstacles in career then by using the planetary peace (Grah Shanti) process and proper daan it is possible to get rid of the problems. There are powerful rituals of tantra and veda also through which it is possible to minimize the impacts of negative planets which are not supporting to become a self employed. Suppose if sun is positive in horoscope and is present in working place and is the master of profit place or income place but it is very weak in that case it is not possible to stand in market successfully. So here we have to use the Ruby Gem stone in proper metal to increase the power of sun. Suppose if any hotel owner is getting the power of Jupiter and Mars but not fully then by wearing the Yellow sapphire and Coral of good quality in the proper metal it is possible to enhance the business. Special Zodiac rings are also very helpful to enhance the planetary power. Special yantra like business enhancer, vyaapar vridhhi yantra, shree yantra, kuber yantra, lakshmi yantra are also helpful to enhance the business or any work. But before using any thing it is good to consult for proper result. Don't worry if you are self employed and not getting the proper result, don't worry if you are not getting the right way to get success in desired field. Use astrology to get the success way, use astrology to increase your business, use astrology to increase your power, use astrology to enhance your personal and professional life.